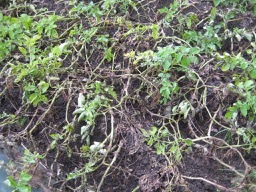 Some time in August, especially when the weather is warm and damp, our potatoes plants start showing signs of blight. 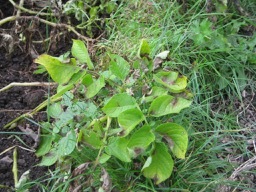 Black spots on the leaves, surrounded with a watery looking “halo”, quickly spreading and turning the potato tops to mush – not to be confused with normal die-back when the plants are mature. Advanced blight, killing off whole plants. Not blight. Normal yellowing and die-back. What should I do if (when!) my plants get it? Cut the tops off, clear up all blighted bits and bury them in your compost to decay over the winter. The spores only live for a couple of weeks without living potato tissue. Do not move blighted tops around the site and infect other peoples’ crops. Leave the potatoes in the ground for two or three weeks before you dig them so that any spores on the surface die off before they reach the tubers. Check potatoes in storage every month or so for signs of rotting tubers. You can still dig a few any time for immediate use. 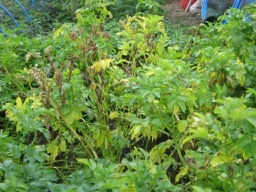 How can I avoid potato blight? You can either grow early varieties, like Kestrel and Charlotte, which are ready before the blight strikes, or grow resistant main crop varieties like Sarpo Mira. For more information, see the RHS web site: https://www.rhs.org.uk/advice/profile?pid=217 . Garlic Scapes Around mid-June our hardneck garlic sends up scapes – curly stems you can eat.